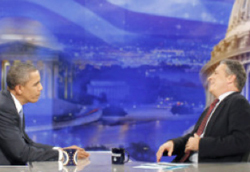 President Obama’s appearance on Wednesday’s “Daily Show” drew huge ratings for Jon Stewart and Comedy Central. The interview, which took up the entire episode, was watched by 2.8 million viewers. That’s nearly a million more than the usual 1.9 who tune in. 1.7 million of those were in the coveted 18-49 demographic. Comedy Central told the New York Times that it was the third-highest rated episode in the history of “The Daily Show” — behind only Obama’s last appearance in October 2008 and Michelle Obama’s appearance in the same month. In addition, the Hollywood Reporter notes that Comedy Central’s website experienced a surge in traffic as well, with 890,000 streams of the interview being played.